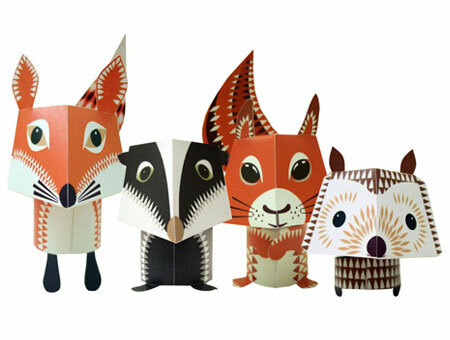 Here we have Fox, Badger, Squirrel and Hedgehog - four sweet woodland animals to make yourself. All you need to start making is some scissors, a ruler and some glue. The friends range from 6cm-11cm high when made and are printed onto 100% recycled 200gsm card. Designed by Madeleine Rogers for Mibo these charming animals make lovely decorations for a party. We also sell Mibo's Wild Bunch, an elephant, monkey, lion and giraffe which are included in Mrs Fox's Party in the Jungle party bags.